Swedish experimental heavy-rock pioneers OPETH have announced they will be releasing their new album, Sorceress, on limited edition pink vinyl with a portion of the proceeds benefiting Gilda’s Club NYC. The band’s 12th studio album will be released on September 30th via the band’s imprint label Moderbolaget Records with Nuclear Blast Entertainment. Additional editions of the vinyl will be announced at a later date. 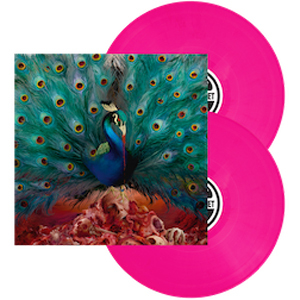 Pre-order the special edition pink vinyl now HERE. The mission of Gilda’s Club NYC is to support, educate and empower cancer patients and their families. A cancer diagnosis can be an extremely isolating experience which triggers many emotions including fear, anger, depression and an overwhelming sense of helplessness. Currently more than 4200 men, women, teens and children attend free support groups, educational lectures and workshops at the West Village townhouse or at hospital partners around NYC. More than 55 percent of their members have a cancer diagnosis, and the remaining are their loved ones – their children, partners, relatives or friends. At Gilda's Club NYC, they believe no one should face cancer alone. The news comes on the heels of the band’s recent reveal of details surrounding the release of their new album Sorceress. Fans can catch OPETH live in concert this fall on their headline tour. Dates are listed below. "The Ward (Bonus Track) 13. Spring MCMLXXIV (Bonus Track)"